Six state units of the Congress party have passed separate resolutions in favour of party vice-president Rahul Gandhi urging him to take over as the president. These state units include UP, Uttarakhand and Delhi. It began after a meeting of all the state Congress chiefs in New Delhi recently. Congress president Sonia Gandhi, too, yesterday confirmed that Rahul Gandhi would soon be made the party chief. The ball has already been set rolling for organisational polls including to the post of the president of the All India Congress Committee (AICC). Earlier, Rajasthan Congress chief Sachin Pilot told news agency PTI that Rahul Gandhi would elected as party president after Diwali. No one has yet challenged Rahul Gandhi’s elevation to the president’s post. Even senior leader Mani Shankar Aiyar has said, “Only two people can be Congress president, mother or son” making it amply clear that Rahul Gandhi is the only choice as the party chief. When he is elevated as the Congress president, Rahul Gandhi will become the fourth-generation fifth person from the Nehru-Gandhi family to officially lead the 132-year-old party. Sonia Gandhi would be passing the leadership baton to Rahul Gandhi after 19 years, for 10 of which she was the chairperson of the ruling UPA. Rahul Gandhi’s elevation to the post of Congress president is happening at a difficult yet advantageous time for him. The Congress has been reduced to its lowest ever tally in the Lok Sabha. It has lost its superiority in the Rajya Sabha for the first time. Yet, the timing of his formal election as the Congress president may work in Rahul Gandhi’s favour. The ruling NDA is facing flak over declining GDP growth rate for consecutive six quarters, with the April-September period recording the lowest figures in three years. The Narendra Modi government and the BJP are being held accountable for growth decline, rising prices, lack of promised jobs and shattered confidence of business community. Questions are being asked over “hasty” and “half-baked” implementation of the GST and demonetisation. Prime Minister Narendra Modi has looked on defensive for the first time in over three years on the question of economy. Rahul Gandhi could not have thought of a better time to turn his party’s fortunes. Rahul Gandhi’s elevation will end the confusion about dual command in the central leadership of the Congress party. However, it will be interesting to see what role Sonia Gandhi assumes or given in the rejigged party structure apart from that of a ceremonial mentor. Rahul and Sonia Gandhi have cultivated their own coteries over the years in the Congress party. The old guard has been more comfortable with Sonia Gandhi and is likely to keep poking its nose in the affairs of the party in future as well. Rahul backers, on the other hand, want to look beyond. As Congress president, Rahul Gandhi will now held accountable directly for all the failures – which bound to come given the state of the Congress – in electoral politics. Rahul Gandhi will have to rebuild his team of advisors to deal with the challenges. The good thing is that Rahul Gandhi has already put people enjoying his confidence in several state units as PCC chiefs and also as the general secretaries of the AICC. If all goes according to the script, Rahul Gandhi will be the Congress president soon after Diwali. This means, the Congress will go to the Himachal Pradesh and Gujarat Assembly elections under Rahul Gandhi’s leadership. For the first time in almost two decades, Congress will fight elections without Sonia Gandhi at the helm of affairs. In Himachal Pradesh, much against the speculations and also the practice of the Congress, Rahul Gandhi declared Virbhadra Singh as the chief ministerial candidate for the November 9 polls. Virbhadra Singh has been battling with corruption charges and facing huge anti-incumbency. In Gujarat, the Amit Shah-Narendra Modi pair is likely to put all its might in election canvassing. It is a battle of prestige for both BJP president Amit Shah and Prime Minister Narendra Modi as Gujarat is their home state. The Congress, on the other hand, is facing dissension in its ranks with senior leaders like Shankersinh Vaghela quitting the party accusing Rahul Gandhi of “inaction”. 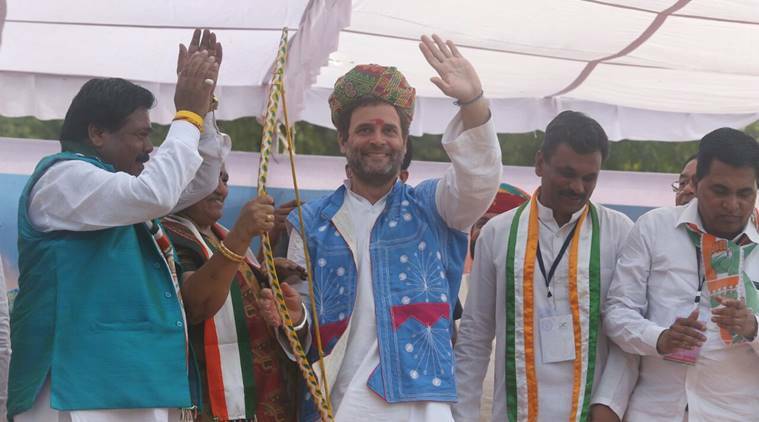 Rahul Gandhi’s organisational skills will again tested next year, when elections will held to eight state assemblies including Rajasthan, Madhya Pradesh, Chhattisgarh and Karnataka. In all these states, the Congress and the BJP have been in direct fight for about two decades. Then, there will be the Lok Sabha elections in the first half of 2019, when Rahul Gandhi would be the automatic prime ministerial candidate for the Congress. The election schedule means Rahul Gandhi will have to lead the Congress in 10 assembly elections and the Lok Sabha polls in the next 18 months. PM Narendra Modi has been a unifying force for the Opposition parties. His rise at the national level has seen many attempts by the Opposition parties to unite under one umbrella. The Opposition’s unity achieved in some measure during Bihar Assembly election in 2015, when the BJP defeated by the Congress-RJD-JD-U alliance. But, the equation has changed now. The most potent force in the anti-Modi camp, JD-U president and Bihar Chief Minister Nitish Kumar has made peace with the BJP and become part of the NDA. Secondly, the Opposition’s unity seemed possible under the leadership of Sonia Gandhi, who had already led the UPA for 10 years soliciting cooperation from the Left Front as well as regional parties like the SP, the BSP, the NCP and the DMK. After 2014, the Opposition parties rallied around Sonia Gandhi to form an anti-Modi coalition. Sonia Gandhi was acceptable to NCP president Sharad Pawar, DMK chief Karunanidhi, TMC chief and West Bengal Chief Minister Mamata Banerjee, SP leader Mulayam Singh Yadav, BSP president Mayawati and also RJD president Lalu Prasad Yadav. Rahul Gandhi may face difficulties in dealing with these veterans. Without the support of non-NDA parties, Rahul Gandhi bound to lead the Congress to another defeat in 2019 Lok Sabha elections. But, only forming a rainbow coalition of Opposition parties may also not guarantee a victory against the election winning machine of Narendra Modi and Amit Shah – two of the master strategists. The Congress has for long targeted Naredra Modi, Amit Shah and the BJP over communal versus secular politics. But, this narrative has failed to pay good dividends to the Congress. Narendra Modi-Amit Shah duo has, in fact, gained more from the attacks by the Congress leadership on this narrative. In Gujarat, Modi-Shah turned the “maut ka saudagar” jibe into a fight for Gujarati pride and successfully won election after election from 2002 to 2014. At the national level, the Congress party’s allegation of communal politics turned into a debate over development versus appeasement. Rahul Gandhi might do well to desist from attacking Narendra Modi and the BJP along the same line. Though caste equation continues to dominate electoral politics, Rahul Gandhi may have to change the narrative to gain the lost ground for Congress and win election against Modi-Shah combination. Be the first to comment on "Gujarat Congress unit passes resolution for Rahul Gandhi as Congress president"